If you have never voted and have only 1 post you can delete your account yourself from your profile. 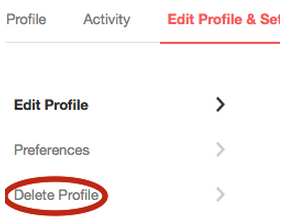 Under "Edit Profile & Settings" click "Delete Profile". You can't delete your account yourself if you have more than one post and / or you have voted on the site. If you want to delete your account after making a post or voting on other posts, you have to contact the Stack Exchange team. The moderators don't have the ability to delete or destroy accounts once they exceed a minimal reputation threshold. To contact the Stack Exchange regarding the deletion of your account, fill out the form and submit it. You need to follow all the procedures exactly as it says. Once the team deletes your account, they will send you an email notifying you of the deletion. You can also find the account deletion form if you click on the Contact us link at the bottom of the site. Not the answer you're looking for? Browse other questions tagged feature-request user-accounts . How do I quit my membership to the ubuntu stack exchange?